Let’s talk about the productivity of your go-to-market (GTM) engine. Are you converting at least 50% of your prospects in 30 days or less? Is your entire organization — from product to marketing to sales to customer success — wholly aligned with this goal? Do you have metrics and conversion ratios for every step of your prospect and customer journey from the first touch to ongoing expansion? Likely not. Most of the B2B software industry CEO’s, investors, marketers and sales executives I meet are frustrated and dissatisfied with their sales funnel performance. And, with enterprise software sales conversion rates stuck in the 15%-25% range, it’s no wonder. The good news is that Sales Ready Product (SRP) go-to-market approaches exist that can yield as much as 2x prospect conversion, a 6x shortening of the sales cycle, and significantly higher average selling prices. These SRP approaches demand that you don’t wait until you are half-way down the sales funnel to expose your product to prospects. Instead, you get prospects to experience immediate gratification with your product as early as possible at the top of the marketing and sales funnel. Then nurture greater usage based on persona type and specific prospect activity. Before you say, “Yeah, but . . . I know what you’re talking about and those approaches don’t work in our business because we are not a SaaS company, or our products are way too complex, or the SRP approach does not align with my Challenger Sales strategy, or . . . some other reason,” consider that there is a Sales Ready Product method that works for any market segment, user persona, software product, price point, level of complexity or go-to-market model. Simply put, the SRP is just a better way to build companies, products and channels. The journey requires a cross-functional commitment across your company, but the successful implementation of SRP will take your business to the next level. The trick is not only to understand the four different SRP customer acquisition options that I describe in Part 1 of this special report, but also to implement iterative companywide activities and capture metrics based on your SRP approach, which I explain in Part 2. The SRP flips a switch in a prospect’s mind, and it also flips a few things in your sales funnel. Traditional go-to-market models work on the idea of capture, nurture, sell and finally install the product and expand usage. By contrast, SRP approaches demand that you don’t wait until you are half-way down the sales funnel to expose your product to prospects. Instead, you get prospects to experience value with your product using their data as early as possible at the top of the marketing and sales funnel. In addition to the traditional Marketing Qualified Lead (MQL), Tomasz Tunguz of Redpoint Ventures points out that some software vendors have gone so far as to define a Product Qualified Lead (PQL).² PQLs identify the points when prospects using a trial or demo version of your product reach activity triggers that signal a higher potential to purchase. With an SRP approach, nurture prospects in the funnel based on persona type and persona specific product activity until “closed won.” Analyze customers’ product engagement levels and usage patterns to up-sell, cross-sell and renewal opportunities. Then smartly roll up users and teams into larger customer transactions using increasingly sophisticated sales methods. In this model, customer and revenue growth is the outcome of data-driven processes focused on building superior products that deliver customer value more quickly than the competition. You might be asking, “How is an SRP different than everything I’ve heard about lean application software development and Minimum Viable Product?” Put simply, a Minimum Viable Product (MVP) approach validates product market fit using a “release-early, release-often” development process in which user feedback is gathered through traditional sales and support methods until the product has matured enough to sell in a reasonably repeatable fashion. A change in go-to-market strategy that creates transformational growth and market leadership for your product in the B2B software industry does not come free. It takes hard work, focused resources and coordinated investments by all parts of your company. But it’s worth it. 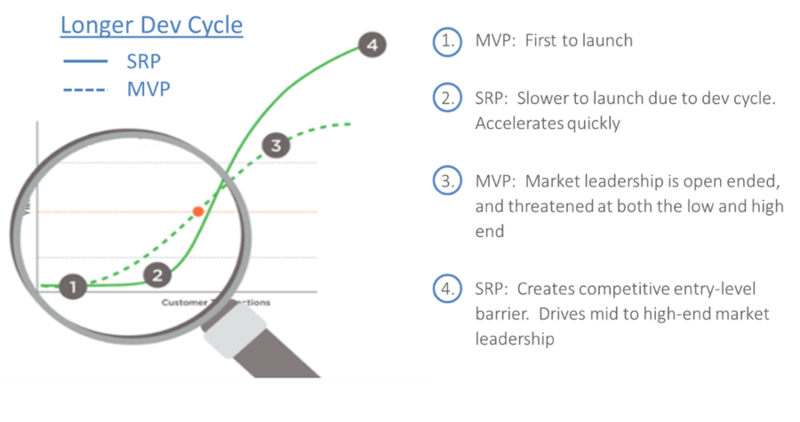 In part 2 of “The Sales Ready Product: Compressing B2B Sales Cycles,” I provide detailed recipes for the organizational micro-activities required to implement each of the four different SRP go-to-market approaches for B2B software companies. Before diving into those details, it’s critical to know which SRP approach is the best fit for your business model. Modern management principles apply. You’ll need to configure cross-functional company activities and metrics to drive incremental internal improvements at every stage of the prospect and customer journey. At each step, you’ll employ measurable and finely tuned acts of daily customer engagement critically focused on specific user personas and value propositions. To reinforce progress and highlight success, implement improvement in a highly agile manner. Drive towards monthly and quarterly “wins,” always seeking to gather market, customer and inside/outside sales team feedback. Measure results and iterate from there. In my experience, four different SRP go-to-market approaches produce consistent “light switch” moments early in the prospect/customer journey. In all four approaches, the prospect’s live company data is used during a trial or demonstration of the software, as further explained in the table below. One size does not fit all. Given these four approaches, you need to choose the SRP approach that is right for your product. Choosing the best SRP approach for your B2B software product depends first on the unit economics of your business. 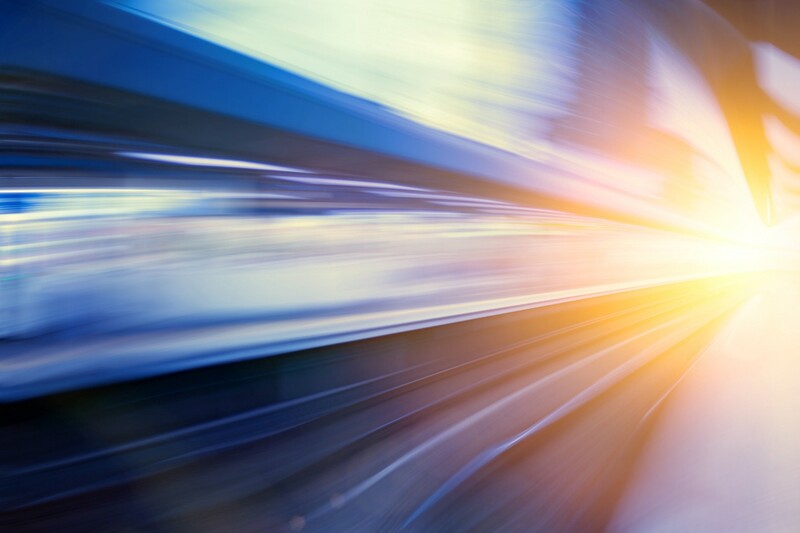 In general, maximizing customer lifetime value (LTV) and minimizing customer acquisition costs (CAC) drive revenue acceleration and profitable growth. To scale successfully, keep your LTV/CAC ratio to 3 or greater with CAC payback (sometimes called the Magic Number) less than 12 months. These are your boundary conditions. Let’s look inside each quadrant. Self Service: Is your product incredibly easy for the prospect and customer to access, trial, purchase and expand usage without the need to speak to a human? Is the product complexity so low that the customer already or mostly knows what they want? Can you reduce your product complexity to drive velocity and capture market share rapidly allowing your product to focus on a broad part of the market? Transactional: Is your product reasonably easy to access, trial, purchase and expand usage but requires inside sales support, technical videos and online support tools? Can you find a reliable balance between average selling price (ASP) and CAC through sales and marketing operational efficiency and focus on the most profitable market segments? Enterprise: Does your product deliver very high value but is difficult for prospects to understand, demo and trial? Does it take massive amounts of effort to integrate your product into your prospects’ tools and data to launch and expand usage? Can your product capture 6–7 figure revenue transactions but entails a complex organizational account management and sales approach? Graveyard: Is your product complex to understand and use? Is the value your product delivers less than the price the customer will pay? Then find a new product and market! User personas — How does the specific prospect persona in your target customer segment like to try and buy? Product complexity — How straightforward is your product to try? Land and expand — Does your customer segment support a “land and expand” strategy? Competitive position — How secure is your competitive differentiation for the specific use case and persona? Time — How much time do you have to win in the market? First, seek to master one of the four SRP approaches before considering expenditure in other go-to-market strategies. Investments in the micro-activities required for each approach — from organization alignment through to product upgrade processes — vary significantly. The time you spend upfront to analyze the right fit for your business model pays off in the long run. Second, one sales model does not fit all — even in the same company and with the same product. Note the swooping arrow in the earlier shown matrix. 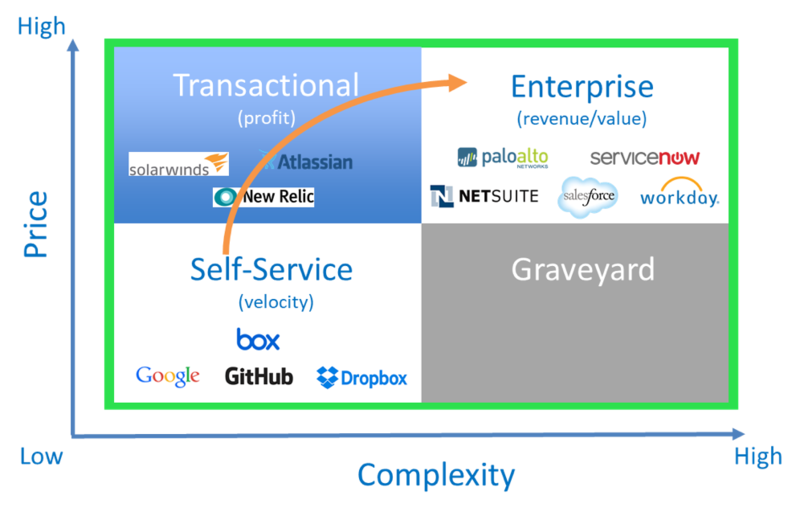 The arrow demonstrates that even companies with terrific self-service sales models like Box and Dropbox have multi-channel sales models that scale to transactional and enterprise as value, complexity, and the ASP increase. 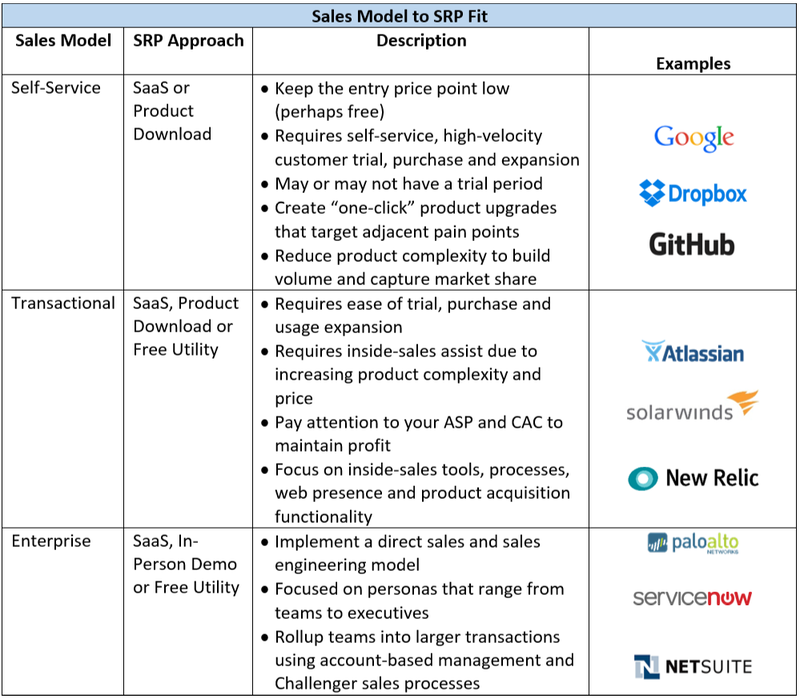 For example, a transactional sales model leveraging a SaaS SRP approach may be appropriate for a prospect that is a single user in the Marketing team. But an enterprise model leveraging an In-Person Demo may be a better SRP approach for a cross-functional, multi-site use case. Expect to expand your SRP expertise given the introduction of new products, personas and use cases as you scale. Third, no matter what SRP approach you choose, you must take as much friction as possible out of the prospect and customer journey. There’s no point in getting your prospect pumped up to buy and then hiding the “go for launch” button. Instant fizzle. Instant CAC hit. Practically speaking, enabling streamlined “one-click” conversion wherever possible is crucial. Prospects must be able to go live, and customers must be able to purchase additional functionality in the context of the pleasure and pain they experience at the moment — as seamlessly as possible. In the late 90s, when I worked at Cooper & Chyan Technologies, we implemented a Product Download SRP strategy in which we provided a free 4-layer printed circuit board router through 15 vendors to their CAD/CAM clients. When the customer PCB board would not route within four layers, or when there were additional alerts regarding noise and timing violations, our customers could seamlessly upgrade to paid functionality with a simple software key. Enabling “one-click” self-service upgrades in the moment of pain switched freemium users into $200K enterprise customers. Mass-market leadership accomplished. Since that time, I’ve had the pleasure and success of employing all four SRP models both as co-founder of CollabNet and now as an advisor to CEOs of high-growth tech companies in my Partner and Managing Director roles at CEO Quest. This two-part special report provides a peek into that work. Disruption is the “soup du jour” of the B2B software industry. And all that disturbance on the outside sooner or later demands a response on the inside, specifically in the way you develop products and go-to-market with your business solutions. Virtually every industry trend, e.g., rapid advances in public cloud infrastructure, pushes software companies more and more in the direction of Sales Ready Product approaches. So, it’s vital to be proactive and get out in front of this wave. If you liked this article, please show your appreciation by “clapping” — click rapidly on the green hands’ icon below — so that other people can find it. Thank you. Sequoia Capital, Jim Goetz & others. The Templeton Compression and Sales Ready Product. Online book. Inkling.com, 2015. Tomas Tunguz. “The Product Qualified Lead.” Post on website. tomtunguz.com. January 15, 2013. Joel York. 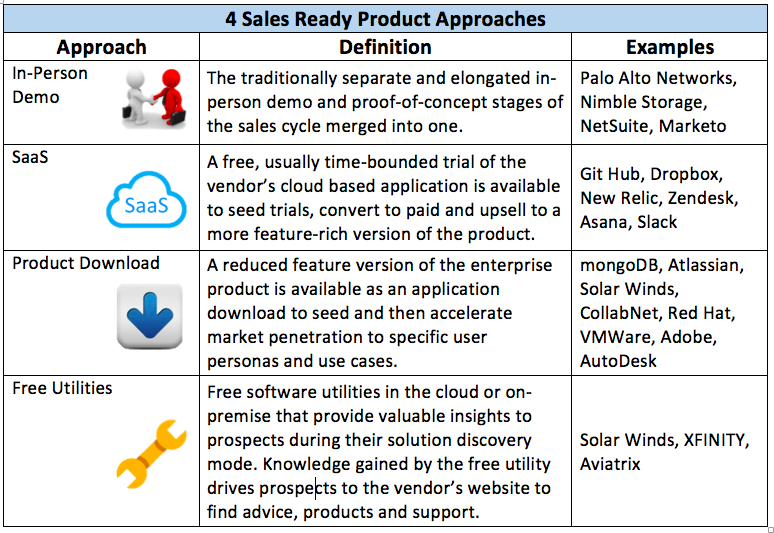 “SaaS Startup Strategy: Three SaaS Sales Models.” Post on website. chaoticflow.com. n.d.
CEO Quest helps early and growth stage founders and CEOs accelerate growth and hit funding targets with evidence-based coaching in the business domains of product, revenue engine, funding, people, and systems design.